Update: Chris Hondros was killed while on assignment in Libya on April 20, 2011. The world has lost an amazingly gifted photographer and an even greater human being. RIP my good friend...you will forever be remembered. Memorial services listed here. Chris Hondros (b. March 14, 1970) is an American Pulitzer Prize-nominated phtotojournalist. Born in New York City to immigrant Greek and German parents, both survivors of World War II, he moved to North Carolina as a child. After studying English literature at North Carolina State and taking his Master's degree at Ohio's School of Visual Communications, Hondros returned to New York to concentrate on international reporting. Hondros has covered most of the world's major conflicts since the late 1990s, including wars in Kosovo, Angola, Sierra Leone, Lebanon, Afghanistan, Kashmir, the West Bank, Iraq, and Liberia. His work has appeared on the covers of magazines such as Newsweek and The Economist, and on the front pages of most major American newspapers, including The New York Times, the Washington Post, and the Los Angeles Times. Hondros has received dozens of awards, including multiple honors from World Press Photo in Amsterdam, the International Pictures of the Year Competition, the Visa Pour L'Image in France, and the John Faber award from the Overseas Press Club. 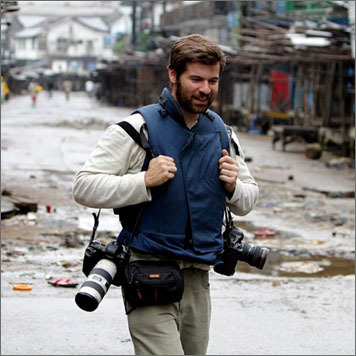 In 2004 Hondros was a Nominated Finalist for the Pulitzer Prize in Spot News Photography for his work in Liberia, and in 2006 he won the Robert Capa Gold Medal, war photography's highest honor, for his work in Iraq. He's also been named a 2007 "Hero of Photography" by American Photo magazine, and was a 2008 National Magazine Award finalist. In addition to his photography, Hondros is a frequent lecturer and essayist on issues of war, and regularly writes for the Virginia Quarterly Review, Editor and Publisher, The Digital Journalist, and other publications. Hondros and his work are frequently chronicled in the general press, including profiles by Smithsonian magazine, CNN, National Public Radio, The New York Times, and Newsweek. He lives in New York, where he is a senior staff photographer for Getty Images, the international photo agency. Copyright 2003-2011. All rights reserved. Site designed and hosted by Desktop Consultants, LLC.